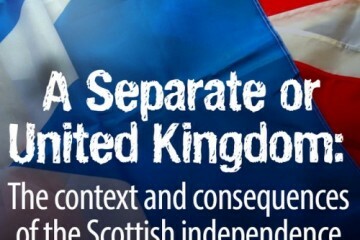 This blog series analyses the issues surrounding Scotland’s impending referendum on independence. The series attempts to shed light on why the referendum is taking place, the context and substance of the debate, and the implications of either a yes or no vote. The prospect of splitting up the British state after more than three-hundred years of voluntary union represents one of the most dramatic developments in the history of the United Kingdom. The popular and scholarly debate has become increasingly sophisticated in recent months, but attention remains excessively directed to short-term economic concerns. A wider comparative frame is essential to understanding the referendum, which will have both international and domestic implications. The blog aims to draw from across the social sciences to shed light on the political, constitutional, economic, and social contexts and consequences of the choice which Scotland faces. ‘You can be proud to be English and British’, Labour party leader Ed Miliband told his party conference. Yet the Labour leader ducked the question of England’s place within the next stage of devolution, instead warning that Prime Minister David Cameron’s raising of the issue of ‘English votes for English laws’ could divide the UK. Labour’s complaint – that the Prime Minister’s raising the question of English votes for English laws was simply a partisan ambush – is unconvincing, because it fails to answer the key questions. Any party which wants to be part of the conversation needs to decide what it is offering to England and the English. Professor Iain McLean of Nuffield College, Oxford, co-author of Scotland’s Choices, was interviewed by Bloomberg TV about his research which claims that accounting for changes in oil revenues and transfers from the rest of the UK would leave Scots about £480 per person worse off. He also discusses the implications of independence for currency and banking, and Scottish membership of NATO and the EU. The result of the referendum on 18 September is very uncertain, but its effects have already been felt. Whichever side wins, and whichever path the Scottish people chooses, the real loser of the long referendum campaign has been the quality of public debate, both in Scotland and south of the border. This is not meant as a trivial slight at any irrationality on the part of Scottish voters, or excessive rambunctiousness in the public demeanour of partisans of ‘Yes Scotland’ or ‘Better Together’. If anything, it is to be applauded that the debate has galvanised such high levels of engagement among the Scottish public, culminating in an expected turnout for the referendum of as much as 80%. Instead, it is more a comment that in the supposed contest between ‘head’ and ‘heart’ reasons for which way to vote, it has generally been the very worst aspects of both that have prevailed over their better, and more useful, fellow-arguments. The debate over Scotland’s future has, especially recently, served up the incongruous (and unromantic) image of a nation of ‘bean-counters’ basing its decision about independence on the expected profitability of either outcome, yet calculating this expectation (on either side) off the back of political and economic assumptions that resemble nothing so much as declarations of blind fear or faith. With separate histories and political-cultural traditions, the UK and Spain do not have the same nation-state DNA. Yet both face issues over regional independence. While the UK Government has legitimised the Scottish Government and supported the Scottish Independence referendum as a highly democratic exercise, Spain stands out as remaining normatively inflexible without, so far, even contemplating any dialogue with the presidents of the Catalan and Basque Autonomies. Other EU nation-states accept the UK’s approach to sort out regional and nationalistic claims democratically. But Spain has been avoiding the demands of the Catalan and Basque institutions and citizens on the basis of both historic and more recent episodes of political unrest. As a result, it seems impossible to open any discussion about the devolution claims of city-regional small nations, particularly in terms of devising an internal, alternative and re-scaled configuration of Spain as a nation-state, which would involve modifying the 1978 Constitution. In the case of the Basque Country, this is presented as the least likely outcome as political violence in the region has been both a major obstacle and also a source of inertia. Nevertheless, ETA (Euskadi Ta Askatasuna), announced a ‘definitive cessation’ of its campaign in 2011 and, therefore, should welcome any kind of democratic implementation that involves devolving powers to the Basque Country. But are there any remarkable differences between EU nation-states such as the UK and Spain? Indeed, I think there are plenty of them. The Guardian newspaper recently published an article by Aditya Chakrabortty entitled ‘Dude, where’s my North Sea oil money?’ (13 January 2014), which drew a comparison between Norway and the UK in terms of what approximately four decades’ worth of fiscal income from oil and gas production has meant for each country. The main thrust of the article was to suggest that the reason why the UK does not have a colossal nest egg like Norway’s is that the UK government effectively squandered its windfall in tax breaks. That is true, but not in the way Chakrabortty thinks. Starting in 1981, once the Falklands conflict (and the need to pay for it) was over, the UK government led by Margaret Thatcher embarked on a process (which accelerated greatly under John Major and even more so under the Blair-Brown Labour governments) of levying progressively less and less taxes on oil and gas exploration and production activities. In other words, Chakrabortty is right in saying that most of the windfall was squandered in tax breaks but, overwhelmingly, the main recipient of these tax breaks was the UK oil and gas industry. As oil prices have skyrocketed from 2000 onwards, the differences in the amounts that the UK levies compared to other large North Sea producers (and not only Norway) have reached astonishing proportions.